Natural Punga Colour Aluminium Large Cremation Urn for Ashes. • 1-Day Expedited shipping at Checkout. Beautiful urn hand crafted from high quality aluminium metal with work from skilled professionals. 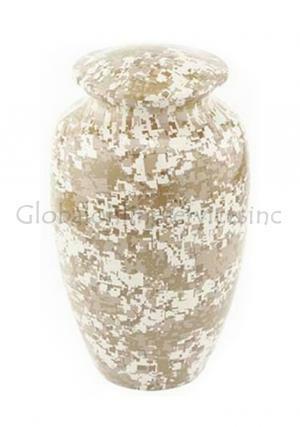 The neck of the gorgeous medium aluminium funeral ashes urn mix finish and labelled screw threading for a tight closure of the ashes inside the urn to secure the last memories. Cleaning Instructions: Light dusting is enough to keep the product clean and do not use any liquids or chemicals for cleaning. 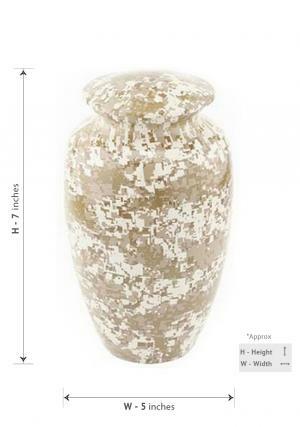 Medium urn capacity: 120 cubic inches, weight: 1.45 Kg; dimensions (inches): height: 7", free standard delivery in UK or selected expedite shipping! The beautiful medium urn has screw threaded lid on top, used to place ashes securely inside the urn and close tight with the lid. Easy to clean, dust with a dry cloth only. Free delivery to all customers within UK mainland. Orders received on OR before 2PM will be dispatched on the same day.